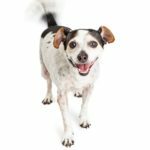 Do not encourage jumping games, or tap your shoulder for your dog to jump up on you, until your dog is completely obedience trained and under control at all times. There are a number of reasons why dogs jump. One, they are happy when greeting people. But the main reason dogs jump is because when they were puppies, people thought it was cute and encouraged it. They should have rewarded calm behavior by bending down, and playing with the pup. As the dog gets older and larger, the owner cannot understand why it is so hard to break them of the habit. YOU sent the wrong message to your dog. People, most unknowingly, rewarded inappropriate behavior, and then, want it to stop! That only confuses your dog. Here is where positive reinforcement, punishment-free obedience training pays off. 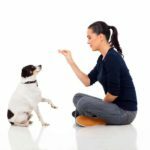 If your dog has been trained to “SIT-STAY” until a release command is given, all you will have to do is give the ‘SIT-STAY’ cue. Now, to see why this is so confusing to them, let’s take a look at this “problem,” from your dog’s point of view. First of all, you need to understand how dogs greet each other. They start off greeting face-to-face. To them, it is perfectly natural to want to jump up to greet you or your guest, to greet face-to-face. 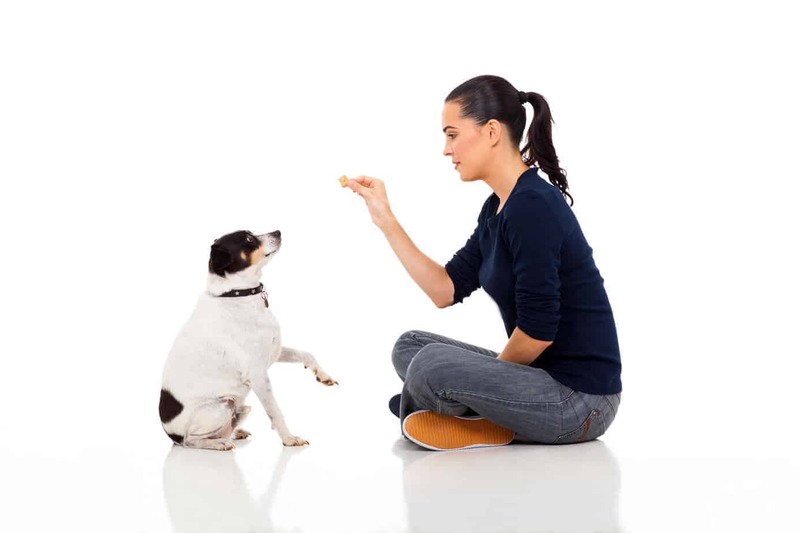 However, it is up to you to teach your dog, it is unacceptable behavior, to greet a human face-to-face. Since they have no real concept of time, you may have only gone to the mailbox, but to them, you have returned to the den safely. First, they want to acknowledge your return, second they want you to acknowledge them, and third, they want to know what tasty morsels you have brought back from the hunt. This excited behavior is perfectly normal for your dog. You must maintain your leadership position in the pack. Leaders only acknowledge pack members when they choose. You must teach your dog they will be acknowledged, but only when they are calm. If they jump up to greet you, ignore them, turn your back to them, and walk away. Cue your dog to “SIT” in their “special spot.” Designate a special area for this action. A sitting dog cannot sit and jump at the same time. IMMEDIATELY, when their tail hits the floor, calmly acknowledge them. Do not make the mistake of getting them excited. Bend down, and let them know they are good dogs! Show them they and their good behavior have been recognized and you are glad to see them. That is their reward. Unknowingly, your friend encourages and rewards the unacceptable behavior by acknowledging the jumping dog. Big mistake! They are rewarding unacceptable behavior. Dogs should never be acknowledged until they are calm, and all four paws are on the floor. Before involving other people to help you, teach your dog to go to a “special spot”, and to “SIT-STAY”, as you open the door. If they move, return them to the spot, give the command once again. Repeat this as often as necessary. Your dog should retreat to their spot, sit and stay, as you open the door. 1. Inform your friends; you are training your dog not to jump up on people. 4. 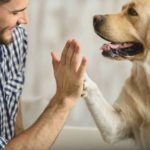 Ask your friend to turn their back to the dog when they enter the house if the dog is happily greeting, yet, all four paws are on the floor, calmly acknowledge the dog. 5. If the dog is jumping up, they are to turn their back, ignore the dog, and calmly walk back out the door. 6. 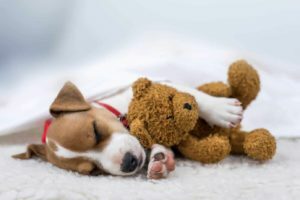 You will need to step in, get your dog under control, return them to their special spot, and give the ‘SIT-STAY” command until you believe they are ready to calmly greet your guest. 5. 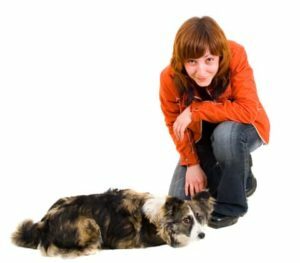 Instruct your friend to calmly acknowledge the dog only if and when the dog is calm, and all four paws are on the ground. During training, being fair, firm and consistent is important. Your dog should have an “on” and “off” button if you insist on letting them jump up on you.